I am still out of town so I just decided that I would feature a few more items linked up to my Catch a Glimpse party. 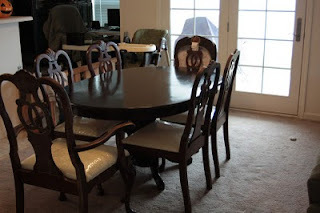 A fabulous dining room table redo at I Can Take on the World... Just Not My Two Year Old. Adorable harvest pillows at The Spunky Diva. This adorable name meaning frame from Kentucky Girl. Super cute black and white apron from The Multi-Purpose Life. Another great redo from Christina's Adventures. 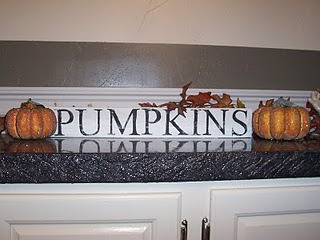 This is an adorable pumpkin sign created by Daydreams and Pretty Things. Thank you to everyone that linked up! I was so happy that you decided to party with me. The party will start again this Thursday at midnight. Thanks for featuring my apron!!! I am really loving the damask!